With a wealth of experience in leading running programs, the NAU assistant coach aims to infuse fun and community into Kids Run Flagstaff. Flagstaff, Ariz.—January 7, 2018—Team Run Flagstaff is thrilled to announce that Jarred Cornfield has accepted the position of head coach for our organization’s youth program, Kids Run Flagstaff. Jarred comes to TRF with great enthusiasm and credentials to match. 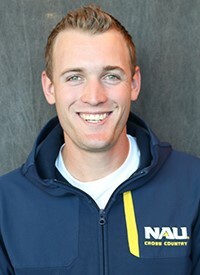 He his in his third year at Northern Arizona University where he was named assistant coach of cross country and track & field in 2017, playing a critical role in the NCAA program’s successful bids for back-to-back national cross-country championship titles. Jarred has also helped lead eight Big Sky Conference championship teams and eight indoor and outdoor All-Americans. “I am thrilled to be joining the Kids Run Flagstaff program and am excited to help the program expand and flourish,” Jarred said. “Running—and the community that comes with it—has a special place in my life and I hope to inspire the younger generation to explore the joy that comes with this experience. As an undergrad at Liberty University in Lynchburg, Virginia, Jarred competed in the NCAA Division I Southeast Regional Championships in cross country and also specialized in the middle distances, including the 1500 meters, on the track. He earned his undergraduate degree in sport management at Liberty and his master’s degree in educational leadership at NAU. Jarred and his wife, Meghan, and one-year-old son, Emmett, reside in Flagstaff and are eager to become even more involved in the running community through their affiliation with TRF. Kids Run Flagstaff is the youth division of Team Run Flagstaff, welcoming children of all abilities and interests in 5th through 12th grades. The mission of the program is to foster enthusiasm for an active lifestyle through running. KRF strives to instill a love of the sport and the value of healthy choices in a fun and encouraging community. In 2018, KRF will kick off winter practices at 5 p.m. on Tuesday, January 16, 2018, at the indoor track at NAU Walkup Skydome. During the winter, KRF will practice once per week (5 p.m. on Tuesdays at the indoor track). In the spring/summer and fall sessions, the program will offer two practices per week (5 p.m. on Tuesdays and 4 p.m. on Thursdays). An annual 12-month membership ($185) includes guidance, support, and direction from an experienced head coach and volunteer assistants, year-round weekly practices, team apparel courtesy of Under Armour, and opportunity to participate in local races if desired (not mandatory), and a fun, supportive team environment where kids can socialize and cultivate a love of running. For more information and registration, please visit our Kids Run Flagstaff website or contact us at info@teamrunflagstaff.com.